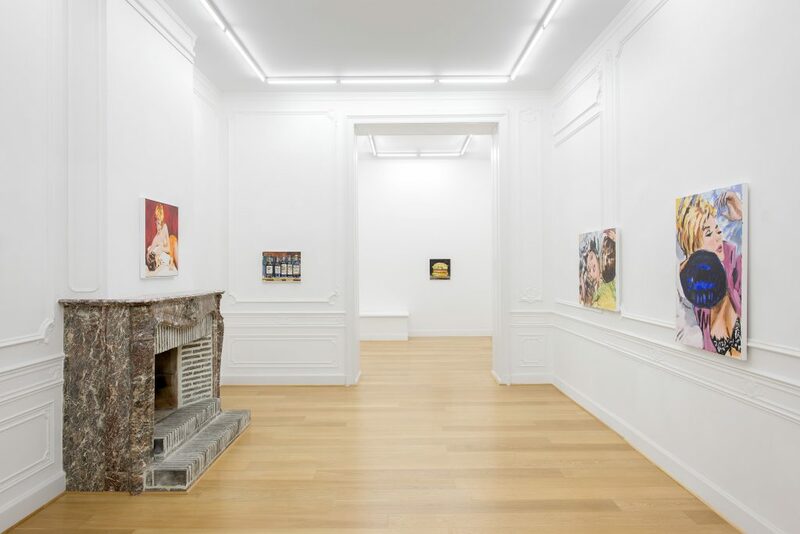 Stems Gallery is pleased to announce the first solo show of Walter Robinson in Belgium. Entitled “Biology,” the exhibition features a large range of his works, including examples of what is perhaps his best known series, melodramatic scenes of desire based on illustrations done for pulp paperback covers in the 1950s. 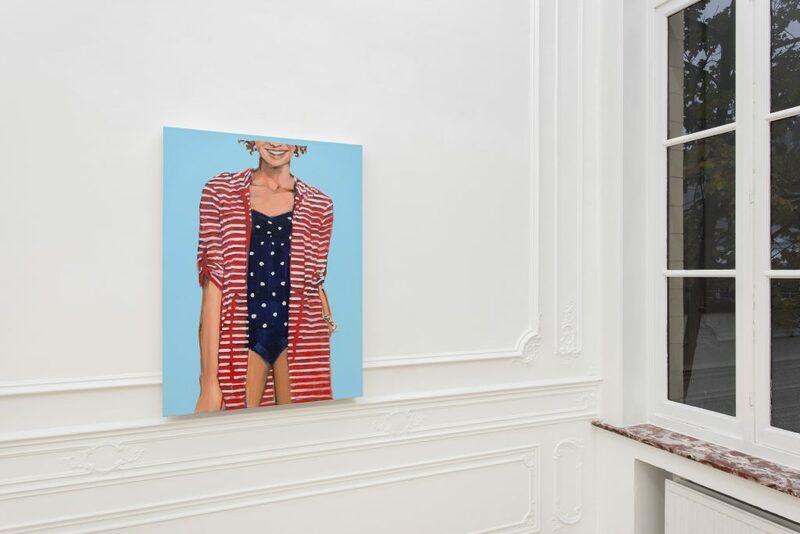 The show also presents more recent figurative paintings derived from clothing ads in department store flyers, and from selfies used as advertisements by working women. 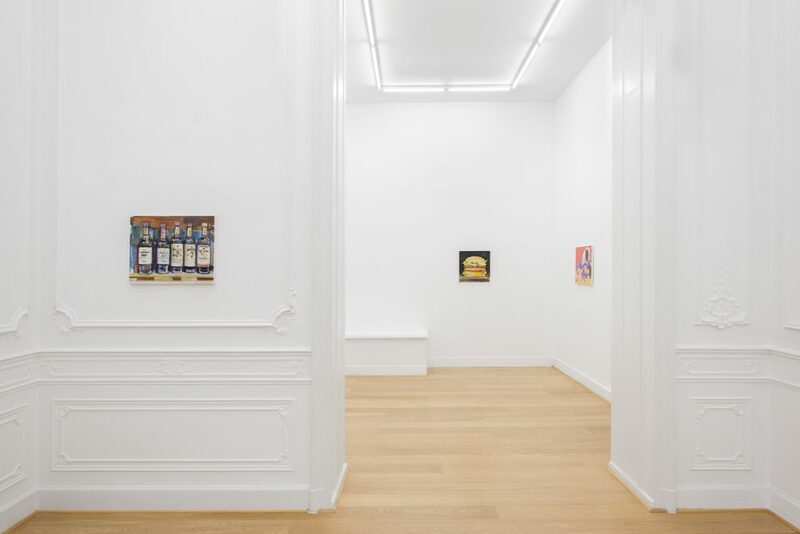 A selection of his ongoing series of still lifes, which range from cheeseburgers and alcoholic beverages to pharmaceutical products such as aspirin, round out the exhibition. Biology is one system for the interpretation and understanding of the “life force” that is present in all living things. It’s an elemental force, and functions in an elaborate dynamic with similarly powerful forces of culture, history, civilization and ideology. Admittedly when Robinson started painting in the late ‘70s it was in service of “desire” in its simple, material forms, notably the physical appetites. When Robinson was younger, it was romance. Now, several decades later, he paints cheeseburgers! 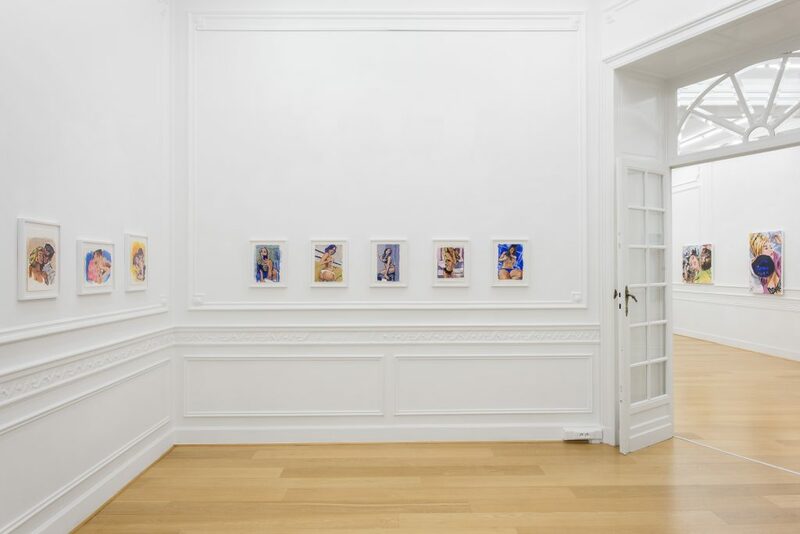 (The show features two works from the artist’s new “healthy series” of paintings of salads, which he claims are the first in the history of Western art.) Evolution is perhaps the grandest manifestation of the life force, and is most clearly referred to in his paintings of kittens: the animal has evolved to appeal to us on an atavistic level. So pictures of cake, the pharmaceuticals, the Normcore fashion models, those are all images that are specifically designed to sell. Recently he has come to think of these “base” desires as all part of this life force. The life force underlies all of our nutty cultural formations of desire at the same time, it constitutes the science of biology. Robinson is viscerally drawn to images that enlist the viewer in a real subject-object dynamic. He paints what the society of consumption showcases from a hamburger to a promotion article such as a shirt on an advertising panel. Everything that people use, buy or yearn for in their everyday life could be in Walter Robinsons work. Pop is all about consumer culture of course, and Pictures Theory takes note of the oversized role that photographic images play in the construction of our reality. The return to representation after the sublimities of Abstract Expressionism, and then again after the intellectual extremes of Conceptual Art, allowed for a particularly sophisticated embrace of the everyday with all its tragedies and comedies. Walter Robinson works in this vein. 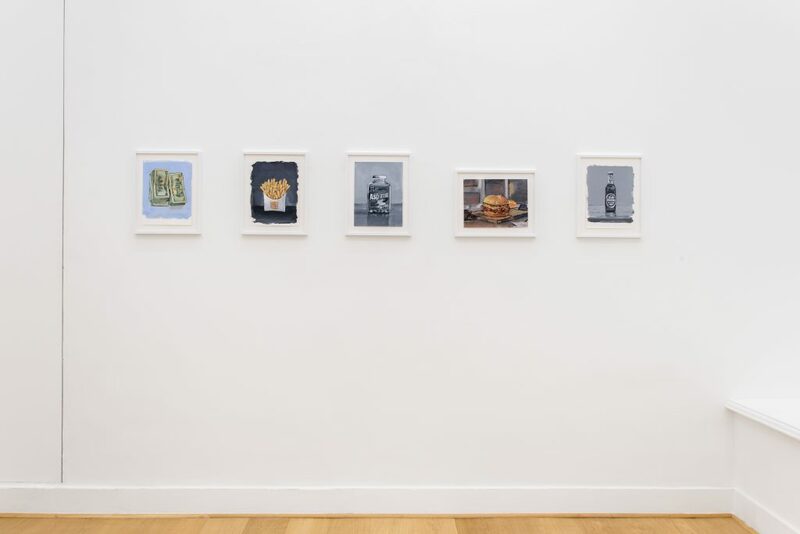 By painting a cheeseburger, which is a still life of the 21st century, he paints something that everyone is utterly familiar with, something that is universal but also individual — we know what we think of cheeseburgers as well as we know anything. As a fast food, the cheeseburger is a humble commonplace at the same time as it is an icon of mass production and the insatiable appetites of consumer culture. 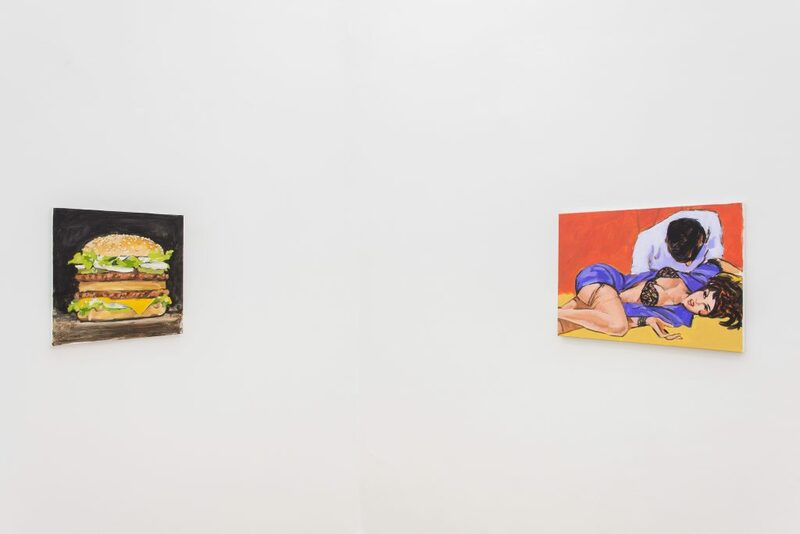 For Robinson, the cheeseburger serves as an emblem of the threshold between the carnal and the spiritual, and the ideal subject for a painting. Walter Robinson (born in 1950, in Oklahoma) is a New York based artist and critic. He graduated from Columbia University in 1972. Walter Robinson became well anchored in the art scene as both an artist and an art critic. He launched the independent newsprint art zine Art-Rite, and wrote for Art in America, eventually becoming the publication’s news editor. He was active in the well-known independent artists’ group Collaborative Projects and was a cofounder of Printed Matter, Inc. 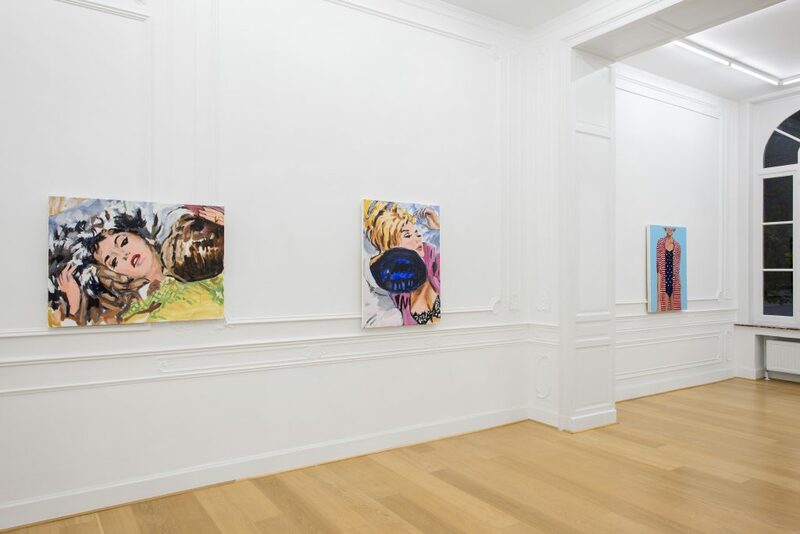 Since the 1980s his work has been exhibited in various galleries in New York including Metro Pictures, Semaphore and other galeries in East Village. He was art editor of the East Village Eye, and both founded and edited Artnet Magazine. Later on he became columnist for Artspace.com, where his essay on Zombie formalism appeared. 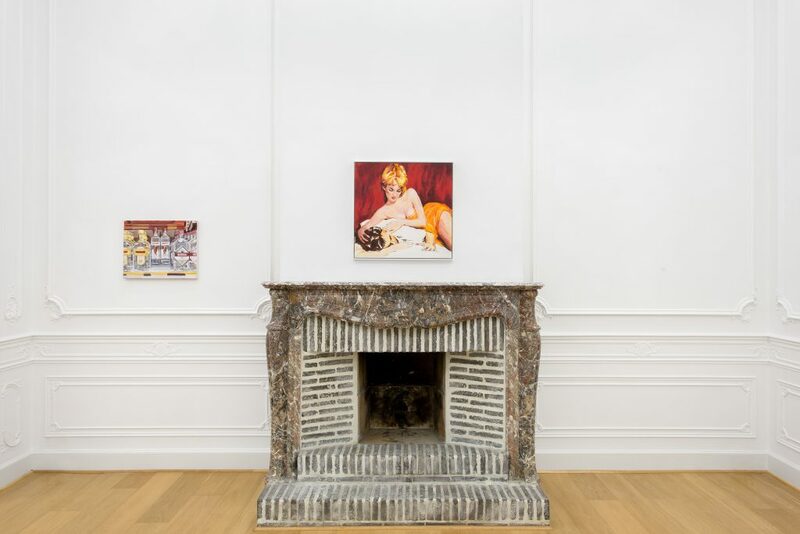 “Walter Robinson: Paintings and Other Indulgences,”a retrospective exhibition dating over 33 years of his career had its final appearance was in September 2016 at Jeffrey Deitch in New York after being traveling in 2014 from the University Galleries at Illinois State University in Normal, IL, to Moore College in Philadelphia. Walter Robinson ‘Biology’, Installation view at Stems Gallery. Hugard & Vanoverschelde Photography © Courtesy Stems Gallery. Walter Robinson, ‘Gin’ acrylic on canvas 41x51cm ,2013; ‘A Taste Of Passion’, acrylic on masonite 61×63,5cm, 1981. Hugard & Vanoverschelde Photography © Courtesy Stems Gallery. Walter Robinson, ‘Big King 1,99E por tiempo limitado’, acrylic on canvas, 41x41cm, 2016; ‘Motel Marriage’, acrylic on Linen, 46x61cm, 2015. Hugard & Vanoverschelde Photography © Courtesy Stems Gallery. Walter Robinson, ‘Womens stripe cotton jersey roll sleeve cover-up’, acrylic on canvas 76x102cm, 2014. Walter Robinson, (on the left) ‘Red Kiss’, acrylic on canvas 61×71, 1986.